Tales from the Road: being a glimpse into the life of a professional speaker – and the things that concern us! If you ever have to make a speech – some of the following may provide helpful advice! In my previous post I talked about the difficulty in “following” celebrated speakers … in my case the time I “followed” Maggie Thatcher, Colonel Ghadaffi, Dame Edna Everage and Archbishop Desmond Tutu! See HERE! Here are some considerations that relate to the venue itself. Any speaker can tell you what the perfect venue looks like: a room that is ideally square or rectangular, is well lit, has good acoustics, a low ceiling, a comfortable temperature and an audience seated so they can all see the speaker. If only this were always the case! Over the years I have experienced many challenges due to venues that were not “speaker friendly” – in fact the “perfect” venue described above is the exception rather than the rule. The problem is that event organisers often choose a venue for it’s novelty value – in either an iconic building or an unusual location. This is fine for the audience … but the needs of the speaker are not always high on their list! However any professional speaker will just get on with it and do the best possible job – despite less than ideal conditions. Here are 5 of my my top 10 speaking challenges as a result of “awkward venues” – nice though they are for the audiences! 1 Audiences in two rooms: All speakers know that maintaining eye contact with an audience is a basic presentation skill. A danger is that if they are out of sight – they can be out of mind! A common problem is a dinner in a room which is either L shaped or not quite big enough to fit the whole audience in – and so some are seated in a separate adjoining room to the one you are speaking in! The way I have dealt with it in the past is to move away from the top table and to stand in the gap or doorway between the rooms! Venues where this has happened include the Chateau Impney Hotel, Droitwich (L shape), and those with adjoining rooms – The Dormy Hotel at Ferndown, The Grand at Bristol and the St. Pierre Park in Guernsey. 2 Audiences in the distance: Ideally a speaker should be as near as possible to an audience – as a space between the speaker and the front tables can often seem like a barrier. That’s why I dislike speaking from a stage where there is a large gap between the stage and the first row – or from a dance floor between you and the audience! The intimacy and “connection” with the audience is harder to establish. On one occasion I spoke at a dinner held “in the round” on the first floor balcony of The Commonwealth Institute building in London. 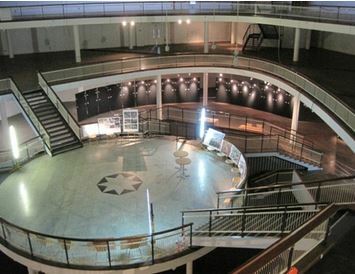 The audience of 250 were on a single line of tables arranged in a large circle around the edge of the balcony – with a 50 yard space in the middle overlooking the ground floor! So not only was there a “gap” – there was what seemed like the Grand Canyon between me and the far tables! At least I had a good “warm up” man – the speaker before me was the American Ambassador to the UK! The Commonwealth Institute: Imagine me speaking from where the photo was taken… and you are sitting at a table on the far side of the balcony! 3 Distractions: I always advise speakers not to stand in front of a window – or any backdrop which can be distracting. I once spoke on the Silver Barracuda – a wonderful luxury Thames cruiser, where guests dine as they enjoy the sights of London. The trouble is holding their attention as the after-dinner speaker with a floodlit backdrop consisting of Big Ben, the Houses of Parliament, St Paul’s Cathedral and other iconic London views passing slowly behind you! 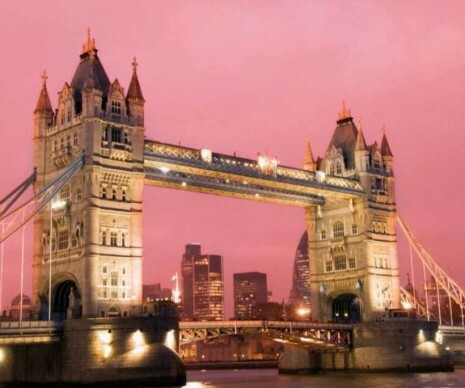 For example – in the photo below – let’s face it – would you rather look at Tower bridge – or me?! 5 Audiences in a straight line: Imagine a room 45 yards above the Thames – 200 yards long – and 5 yards wide! 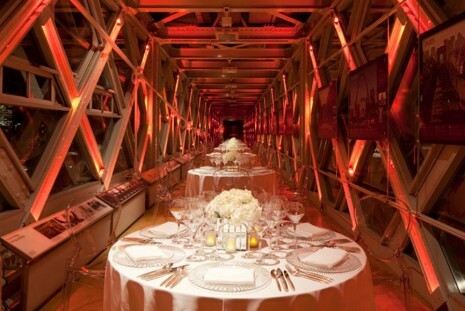 The Walkway across Tower Bridge is a wonderful and most unusual venue for a dinner – unless you are the speaker! (Check the photo in (3) above!) It’s where I was once faced with an audience seated on 25 tables lined up in one straight line stretching into the distance! See photo! So where would you stand? At one end facing the entire audience so you could see them all in the traditional way? Then those at the far end would be similar to the “out of sight out of mind” problem in 1) above. My solution was to move to the exact centre – and keep turning from side to side! Although it meant I had my back to half the audience at any one time – at least by turning constantly (as if I was watching a tennis match!) meant that I was at least able to keep their attention during my speech!